This extremely fast growing Clematis is ideal for covering an unsightly wall, fence or building as it requires maximum support. 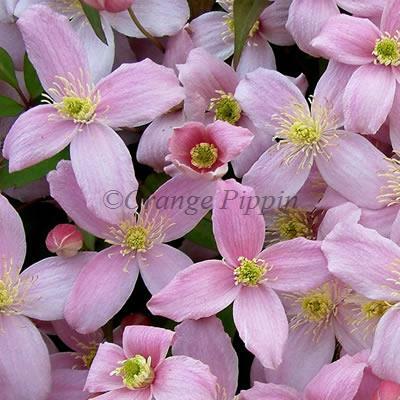 Clematis montana 'Rubens' bears masses of fragrant, mauve-pink flowers during the late spring and early summer against purple flushed, green leaves. This non-evergreen climber would be better suited where space is not an issue, for a slower growing variety for the smaller garden, choose Clematis montana 'Freda' as an alternative. Clematis montana rubens was found in China by Augustine Henry. It was rediscovered by Ernest Wilson who sent seed to Veitch and Son of England. What is now known by this name is not, however the palnt Ernest Wislson described: that has been lost to cultivation.